I have just [nearly] concluded a war with my bathroom vanity. Wait a sec, what is a "vanity" anyway? A sink built into a counter and cabinet unit in a bathroom is apparently called a vanity these days. My family never called it this when I was growing up, but, then again, our bathroom sinks were freestanding, so maybe we never had occasion to refer to a vanity. I generally referred to this item as the "bathroom sink countertop/cabinet thingie" until I picked up the word vanity from various home improvement store employees. According to the Oxford English Dictionary, the earliest uses of the word vanity to describe a dressing table were in the 1930s. This use of the word no doubt derived from more conventional use of the word (placing importance on matters of one's own personal appearance and beautification). Prior to this (and perhaps concurrently), a dressing table containing drawers and used for the application of makeup and accessories was called a "lowboy". This went along with a "highboy", which was a taller set of drawers for storing clothes, like a dresser or bureau or chest of drawers, which are all terms describing essentially the same thing. Just to confuse matters, the word lowboy is also a name for a semi truck trailer that is low to the ground between the two axles so you can carry taller loads. A semi truck is also called an 18-wheeler or a big rig. I don't know when the word vanity was first used to specifically describe the bathroom dressing table with a built-in sink. It would not surprise me at all if this use of the word was popularized by home improvement stores' marketing departments. As I said, though, I have just [nearly] concluded a war with my bathroom vanity. My bathroom was completely refinished sometime fairly recently. The shower and floor are beautifully tiled, and all the fixtures are modern. The walls look kind of rough, as if lots of holes have been patched with varying amounts of care over the years. But, overall, it's a very nice bathroom for such an old house. Except for the stupid vanity. Whoever installed the vanity, I think, intended for the side of it to be flush with the wall. They cut the baseboard off the wall, or else it was already gone from some previous vanity, leaving a long hole in the wall where the baseboard used to be. 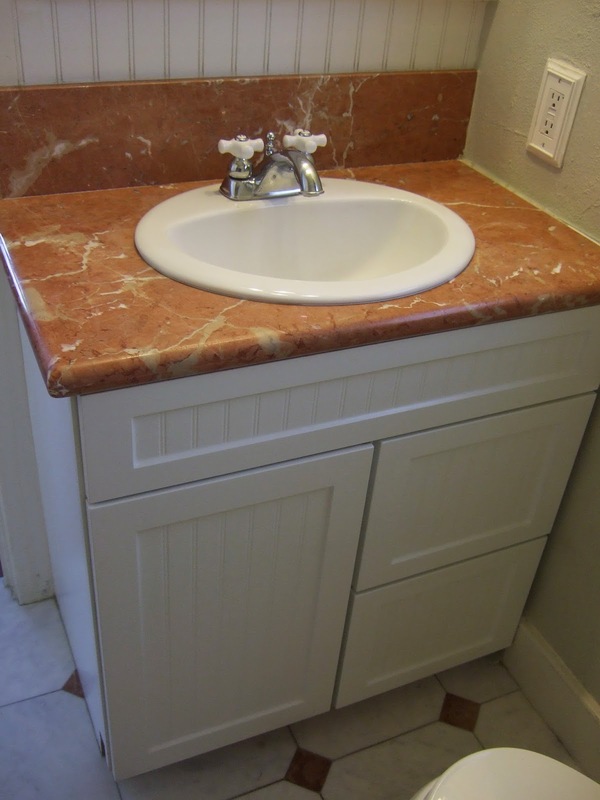 Unfortunately, the installer neglected to account for the fact that the stone counter on top of the vanity hung over the edge by an inch or two, which means that the side of the cabinet can't be flush with the wall. The installer just left the large hole in the wall instead of patching it and installed the vanity right next to it. When the weather started getting cold last winter, I would stand there brushing my teeth and feel sudden cold drafts of air on my toes. All the cold air was rushing up from under the house and blowing through the hole into the bathroom. Brrr! I wasn't sure what I wanted to do about the hole, so I just taped a bunch of plastic over it for the remainder of the winter. My vanity and I entered a stalemate while I planned the best course of action. The way to really fix it would have been to remove the entire vanity and patch the wall correctly, but that would have been a huge job that probably wasn't worth the time and energy it would take. My dad is a big proponent of expanding foam, so when he visited in April, he just broke out a can and squirted it all into the hole and the big crack between the edge of the vanity and the wall. Right next to the hole, the floor tile didn't reach all the way to the wall, as if it had been cut specifically to accommodate the leg of some previous vanity unit (which is weird because I would have thought that this vanity and the floor tile were put in at the same time). I got some floor grout and just filled up this empty spot with grout. The foam and grout helped a lot, but the visible part of the wall hole wasn't completely sealed, and it was still bothering me. After neglecting this battle for a while longer, I finally mixed up some more of my favorite wall plaster and plastered over the hole. This was followed by priming and painting the hole to match the wall color. The hole still looks a little weird, but at least it's sealed now, and it doesn't really show unless you're crawling around on the floor. Part of my frustration with this project is that crawling around on the floor in the bathroom is really hard. It's a small bathroom, and it's hard to reach back into that corner. The front of the toilet is very close to the vanity. I waged a violent battle with the vanity drawer trying to take it out so I could reach the corner. The drawer is meant to come all the way out, but it runs into the toilet before it really comes out far enough. You have to get a little creative and engage in advanced geometric maneuvers before you can finally remove it completely. Getting it back in requires a similar battle. Speaking of toilets, whoever installed the toilet put it in with a 5-6in gap between the tank and the wall, which seems kind of dumb given the general lack of space in the bathroom. Actually, they probably did it this way so that they didn't have to move the piping in the floor. They just connected the new toilet where the old one had been connected. As to why they chose such a long toilet, I have no idea. They could have at least gotten a shorter-bowled toilet so that tall toilet-sitters wouldn't bump their knees into the vanity or have to sit sideways. Speaking again of toilets, the word toilet was also used at some point to describe a dressing table, but it was also used to describe the act of grooming or dressing. If you read Victorian literature, you'll see references to someone performing his or her toilet. Today, it's sometimes used to refer to the whole room containing a toilet, which is also referred to as a restroom, bathroom, lavatory, lav, water closet, powder room, head, john, loo, necessary, and probably many other things. The word toilet derives from the french toile, which means cloth, which originally described either the cloth on the dressing table or the cloth worn to cover the shoulders while the wearer's hair was being dressed. When I was growing up in Mississippi, sometimes older Southern ladies would refer to a toilet as the "commode". "Do you need to use the commode?" "Don't forget to flush the commode." Like vanity, this was another word we didn't use at home, but I learned in preschool or kindergarten that it meant toilet. The Oxford English Dictionary says that commode used to refer to an elaborate chest of drawers, and also a small piece of furniture in which the chamber pot was kept, which must be how the word transferred from the furniture to the actual thing you do your business in. In case you weren't confused enough already, the OED also gives the meaning of the word commode as "A tall head-dress fashionable with women in the last third of the 17th and first third of the 18th centuries, consisting of a wire frame-work variously covered with silk or lace; sometimes with streaming lappets which hung over the shoulders." In case you didn't know (I didn't), a lappet is a cloth flap that hangs off a headdress over the shoulders (which perhaps you could call a toile if you wanted to). In the UK, commode is apparently used to describe a wheeled chamber pot used in hospitals by patients with limited mobility. Interestingly, the OED does not list a common flush toilet as among the meanings of the word commode. Clearly the OED writers need to pay a visit to Mississippi sometime soon. The Wikipedia writers, on the other hand, have got it right and actually do mention this colloquial use. Returning to the discussion of my vanity, I fought another geometric battle and got the lower drawer back in. Above the lower drawer is what should be an upper drawer. However, it's actually just another stupid false drawer front panel. You can't put a real drawer here because the sink drain pipe goes into the wall right where you would have to anchor the drawer runner. I took out the false drawer front panel when my dad did the expanding foam, but I couldn't put it back using the same hardware because I couldn't reach the screws properly. So, I ordered some more of those plastic clips I used on the one in the kitchen. I measured wrong the first time, and it came out lopsided, so I had to take it out and redo it. I really hate those things. I thought I was finished with my vanity war after patching the hole and replacing the drawer and panel, but last week, when I was sitting on the commode, I heard a suspicious drip, drip, drip... I opened the vanity cabinet, and some water I had splashed onto the counter top was oozing under the sink and dripping into the cabinet. Yay! Luckily, this is an easy problem to deal with. I just needed to re-caulk the sink. I scraped out the old icky caulk with a razor blade. I cleaned out some gross goo that was growing in the gap using vinegar and a toothbrush, and then I wiped it all down with rubbing alcohol to make sure the surface was perfectly clean. I squirted fresh caulk into the crack between the sink and the counter and cleaned it up with my finger and a rag following the method shown in this video. It came out very neat and was not difficult at all. I also re-caulked the crack along the back of the counter top where it joins the backsplash. Right before I bought my house, the previous owner dropped something onto the porcelain faucet handle and broke off one of the four spokes. She felt really bad about it, since she was about to close on the sale of the house, so she very kindly purchased a replacement handle on ebay, but she didn't have time to install it. She left it in the house for me. I had never gotten around to installing the new one (the old one still functioned), but since I was working on the sink, I decided I would finally do it. I disassembled the handle, but unfortunately, although the new one looked identical, the hardware attaching it to the faucet wasn't the same size, so it didn't work after all. Luckily, though, I found a little tag inside the faucet with the manufacturer's name and the part number. I will call them next week and find out if they can send me a replacement part. The tag also had a date of manufacture on it saying October 2005, which gives me some idea of when the bathroom was redone. So as you can see, my vanity war isn't completely won, but I've almost prevailed. We're under a ceasefire until I can consult with the faucet manufacturer. Unfortunately, I've recently received intelligence that my bathtub has joined forces with the vanity and is demanding a re-caulking of its own. Ah well, a project for another day. I called Pfister Faucet, and they were super nice and helpful regarding the broken faucet handle. The lady looked up the model number and found all the parts for it. The porcelain handles are still manufactured. Although the faucet’s warranty is good only for the original owner of the faucet (not me), she said they could make an exception and send me a new handle anyway at no charge. In fact, she said she would send me two. It’s a good thing she did because although the fittings are the correct size, the handles themselves aren't actually the same size as the old one. You wouldn’t be able to tell unless you had them side by side (which, of course, on a faucet, they would be), but the new one is a bit larger and bulkier. I actually like the smaller, more delicate older ones, but oh well. So, I ended up replacing both handles. I'll keep the old ones just in case. Anyway, Pfister Faucet gets an A+ for excellent customer service.